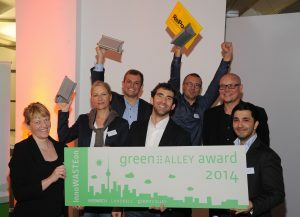 Here is the hall of fame of Green Alley Award winners and finalists. Get inspired by these outstanding and world changing ideas for a more sustainable future! 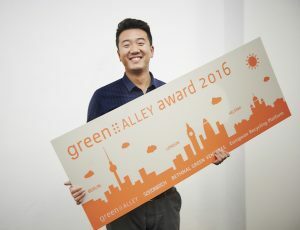 Aeropowder’s unique idea was especially convincing at the Green Alley Award 2018: The startup uses waste feathers from the poultry industry to produce sustainable thermal packaging. After cleaning and treatment, the feathers are covered in a certified, compostable food grade liner. This textile is called pluumo and serves as an environmental-friendly alternative to conventional polystyrene packaging, PE-foams or thermal foil. In 2014, over 160 kilograms of packaging waste was generated per inhabitant in the EU, most of which was plastic. 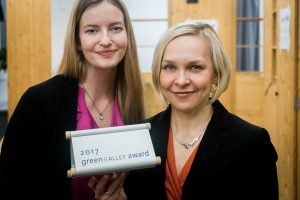 As an alternative, the Finnish startup Sulapac has invented premium eco-packaging, which is 100% biodegradable, made from wood and natural adhesives. 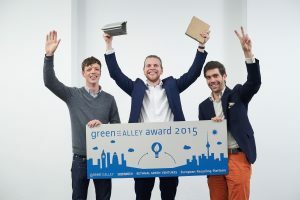 There is no escaping air pollution which is why the German startup Green City Solutions invented CityTree, a solar powered installation consisting of moss cultures that filters the air in cities. 5,000,000 tons of waste per year are generated from plasterboard offcuts, a toxic waste which is tricky to recycle, so Adaptavate from the UK developed Breathaboard, an eco-friendly alternative to plasterboard. Tom and Alberto’s paneling is not only made of 75 percent agricultural waste, it also regulates moisture. RePack from Helsinki reduces packaging waste in e-commerce by creating a multipath system for reusable packaging. 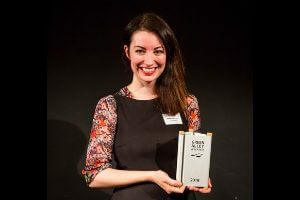 FoodLoop from Cologne uses a mobile app to tackle the vast amount of food waste – 550,000 tons annually in Germany. GreenLab Berlin recycles the waste from cocoa production into a vegan and organic fertilizer.